Postnatal specialist instructor for every class. Access to a private Facebook group - exclusive recipes and at-home postnatal workouts. Safe postnatal fitness with baby by your side. Over 60 postnatal healing & fat-loss recipes. Pelvic floor and core training for a flatter stomach. The best way to exercise post pregnancy. Strengthen your whole body to feel great for everyday mum life. Correct posture changes that happen during pregnancy. Feel like you again and focus on you in Buggy Fitness. Mum and baby bonding time with baby massage. To join us for a FREE Buggy Fitness Session please complete this health form and Manda will be in touch. This class runs every Monday & Friday at 10.30am-11.30am and Thursday at 10.00-11.00am, at Eastwood Park in Hasland. To join us for a FREE Nurture Fitness Session please complete this health form and Manda will be in touch. This class runs every Thursday 12.45-2.15pm, at 'The Parish Centre Stonegravels' in Chesterfield. To join us for a FREE Mumma Fitness Session please complete this health form and Manda will be in touch. This class runs every Monday at 1.00pm-1.45pm at the Ikon Church in Chesterfield. 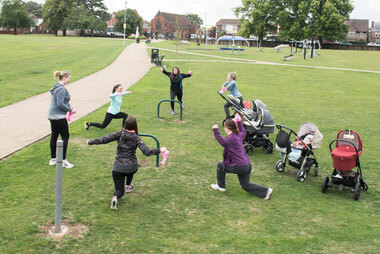 Buggy Fitness - mum and baby exercise class. Focus on you whilst baby is snug in their buggy. For babies of any age, as long as they are happy to stay in their buggy for the hour. Nurture Fitness - exercise for new mums and baby massage in one class. Safe postnatal exercise to give you energy, help you feel strong for everyday life and correct posture changes from pregnancy. Work on your core and pelvic floor for a flatter tummy and feel more body confident. After the fitness you spend time bonding with your little on with lovely baby massage techniques. Mumma Fitness - postnatal fitness after pregnancy with baby by your side. A 45 minute mum and baby exercise class to give you energy, help you feel strong for everyday life and correct posture changes from pregnancy. Work on your core and pelvic floor for a flatter tummy and feel more body confident.